This environmentally friendly product is made to replace common Flourecent Neon fixtures can be bent and is ideal for installations requiring variable lengths. LED Neon Flex can be cut at any cutting mark every 4 inches. Is a Water proof product uses a PVC jacket givining a very solid look to achive uniformity. It is ideal to create edges. 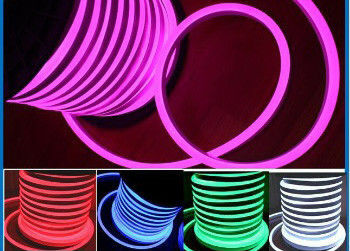 LED neon Flex, also known as flexible neon tube, it has a hazy color and unique, you can feel a kind of hazy atmosphere to make your life more colorful feeling. This product is widely used in outstand the contours of the various buildings, the construction of large-scale lighting design, and a variety of interior decoration, residential landscaping. Led Neon Flex is comprised of solid-state LEDs in series solder on Flexible PCB housed by an inner plastic extrusion core. 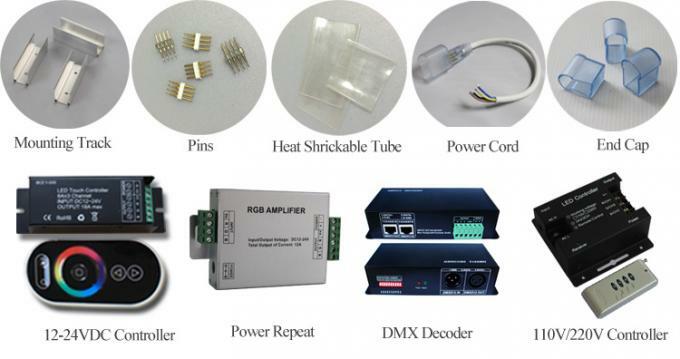 the light source has SMD2835 (single colors) and SMD5050 (RGB),An UV stable outer plastic jacket further protects the inner core. The plastic jacket will be the translucent colored and the LED will be Red, Orange, Blue, Yellow, Green and White. Base our patented technical, we produce the Neon Flex with a continuously color linear effect as well as Glass Neon. Advantages of RGB LED neon ribbon? 7. 100% unbreakable; 100% waterproof. What are the applications of RGB LED neon? City lighting, sign, advertising logo, architectural outline sketch. - 240V /120V _ one power cable could load 100m in one continous line. 3. The difference : milky white or colored - PVC skin ? - The color with colored PVC skin looks _ deeper. - The color with milky white PVC skin looks _ slightly brighter. 4. Minimum bending radius ? 6. Minimum order quantity ?